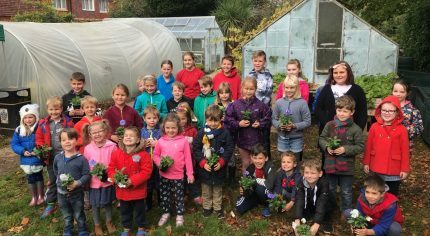 Over 60 children, including some as young as three, took part in free Bloomin’ Kids’ Gardening Workshops during the half term holiday at the end of October. The workshops were run by Farnham Town Council as a way of making it easy and fun for families to try out gardening and equip them with the knowledge and skills to garden at home too. As well as planting bulbs and sowing seeds, children had fun with arts and crafts activities using autumn leaves and took home gardening themed goody bags with their newly planted seedlings. At the Farnham in Bloom Winter Celebration on 16 December, they will have the chance to buy their winter flowering hyacinths if they wish. “Getting hands-on with the natural environment is so important for children’s development and appreciating the world around them. Every time we run these workshops, we are impressed with how much the children enjoy getting their hands mucky and the process of planting flowers, fruits and vegetables. Take a look at the photos of the workshops on our Facebook page to see for yourself how much they enjoyed it,” said the Mayor. Among the seeds sown were broad beans, peas, rocket and lettuce, which were generously donated by Marshalls Seeds and Mr Fothergill’s Seeds. The event was run entirely by volunteers from the Farnham in Bloom Community Group and staff from Farnham Town Council so that taking part was free for families. A raffle of cyclamen plants, and seeds from Mr Fothergill’s Seeds took place for parents at each of the workshops, also for free. Many of the children came from Farnham but some families had travelled from Aldershot, Tongham, Froyle and Ash. Pre-schoolers, primary school and secondary school aged children took part. Bloomin’ Kids is part of the Farnham in Bloom programme of activities. Visit Farnham Town Council to find out what else is going on for the initiative or how to volunteer.